In most cases, when a light comes on it represents a positive state of enlightenment. However, when your check engine light comes on, it usually represents a state of panic. While being stranded away from home is terrible enough, the repair bill from your mechanic can make you feel as if you are having a real Nightmare on Elm street. Even if you don’t own real estate on Elm Street, the recent 2013 CarMD Vehicle Health Index offers everyone a few reasons to be scared of repair bills. According to this study, for the first ime in six years the average vehicle repair cost jumped 10% on vehicles between the model year 1996 to 2012. While everyone may feel the crunch from rising repair costs, not all repair cost increases are rising equally. Continue reading to learn which states have the most and least expensive repair costs along with other valuable insights from the study. Simply put, repair costs tend to vary by region. According to CarMD, the most affordable state to have your car repaired in is Vermont, which experienced a decline in repair costs over the previous year. On the other hand, New Jersey eclipsed the West Coast state of California as the most expensive state to have vehicle repairs. 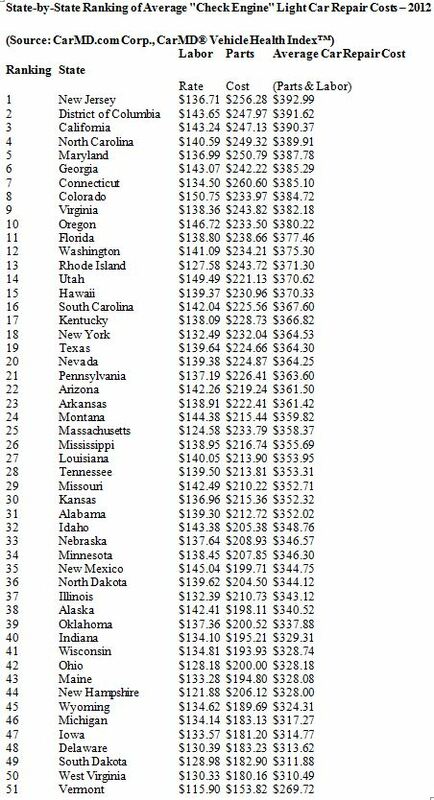 However, California is still among the top five most expensive states along with North Carolina, New Jersey, the District of Columbia, and Maryland. In comparison, a standard visit to the repair shop in New Jersey can cost owners up to 50% more than a visit in Vermont. While some states have more expensive repair costs than others, all regions across the United States share one thing in common: rising repair costs. The following list explains the rise in repair costs across the United States by regions. The Northeast region experienced the highest rise in repair costs with a 11.56% increase. The South closely followed the increase in the Northeast with an increase of 11.02%. The Midwest experienced an increase of 8.98%. The West Coast experienced the least increase with only a 6.53% spike in repair costs. It should also be noted, the majority of the rise in costs can be attributed to the 17% rise in labor charges. At the same time, the cost in replacement part costs only rose a meager 6%. With the significant spike in repair costs in the Northeast, it’s easy to attribute most of these costs to the super storm Hurricane Sandy. Another reason for the spike in repair costs is due to the type of repairs being made to the vehicle. For example in the District of Columbia, approximately 10% of the repairs in 2012 cost consumers over $1,000. According to the study, the most common reason for seeing your vehicle check engine light is a malfunctioning oxygen sensor. A bad oxygen sensor can decrease your fuel economy by up to 40%. In midst of the ominous rising repair cost news, CarMD does offer vehicle owners something to smile about. The Vehicle Health Index reports an increase in the overall longevity of vehicles. This means that auto manufacturers are building cars, trucks, vans, and parts that last longer. 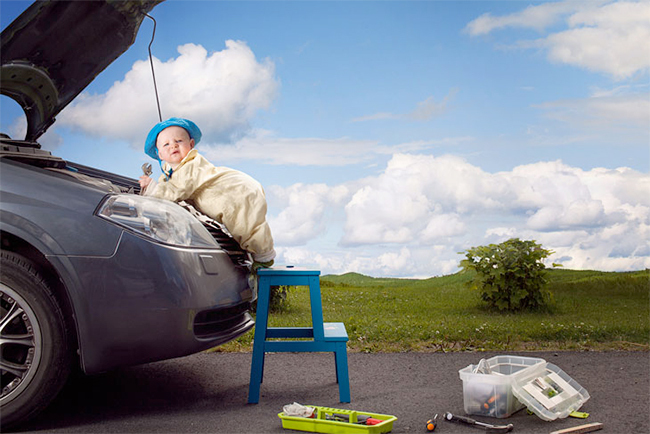 Additionally, the study also points out that vehicle owners are getting much better at actually making minor do-it-yourself repairs on their vehicles. Another significant insight provided by the study is the significant increase in the number of hybrid vehicles has resulted in a drop in hybrid vehicle repair costs. This decrease may also be attributed to the rise in the number of mechanics qualified to work on hybrid vehicles.